Background: As the final decade of the millenium began, I continued traveling as a freelance electronic graphics operator. I worked the World Wrestling Federation's "Royal Rumble" telecast in January 1990, the Metro Conference basketball tournament in Biloxi in March, and WrestleMania VI at Skydome in Toronto in April. WrestleMania VI was the only telecast I ever worked with the late Steve Allen. We didnt meet; I was at my keyboard, he was carrying an interview microphone. It was also the night when the Ultimate Warrior, his facepaint beginning to peel off, defeated Hulk Hogan in the main event to win the championship. Twenty-four years later, the 54-year-old Warrior dropped dead. 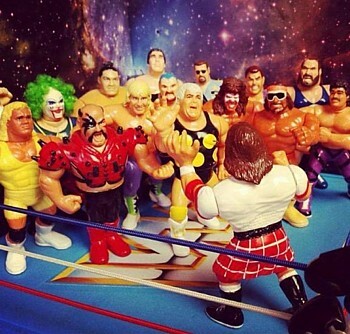 Of the 36 wrestlers who competed at WrestleMania VI, he was the 12th to have died, all of them under the age of 64. TheRealVirgil tweeted There is a hell of a party in heaven tonight when Rowdy Roddy Piper (right) died the following year, in 2015. Fred Rheinstein of World Sports Enterprises produced some NASCAR races for TBS. I was at Richmond in February and September of 1990, and at Charlotte in May and October, along with font coordinator Patrick Perrin, fellow operators Abby Smith and Don Thompson, and announcers like Mike Joy and Chris Economaki. 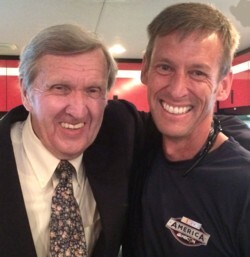 On the left, announcer Ken Squier with Pat Perrin in 2017. In July 1990 on SportsChannel America, I worked another NASCAR race at the new track in New Hampshire. And much else was going on besides. Here are some excerpts from the letters and technical memos that I wrote. Let's see, now. The boys talked you into playing their Nintendo games on Christmas day, so you probably became addicted immediately and found yourself sneaking into the living room in the middle of January nights to try to figure out how to overcome some particularly diabolical electronic challenge. Now, after six weeks, you've mastered most of the games that interest you, and you're beginning to return to a normal life. If so, welcome back! Personally, I've never gotten very interested in those diversions. In the middle Seventies, I did have a Pong-type game which bounced a black-and-white tennis ball back and forth, but when it wore out I never replaced it. Maybe I lack interest in video games because I get to play with other really neat gadgets in the TV production trucks where I work. For example, there's the DVE, or Digital Video Effects box. This takes an ordinary TV picture and expands it, squeezes it, moves it around, changes its shape, or makes it "explode." You can get fun-house-mirror effects. Or, speaking of mirrors, there's the two-cigar trick. Later this week I'll get a chance to use this equipment (for serious purposes, presumably) in the land where much of it is made. I'm leaving in two days for Japan, where I'll be doing the electronic graphics for the HBO telecast of the Mike Tyson-Buster Douglas boxing match. The fight takes place at noon Sunday, February 11, in Tokyo; considering the time difference, that's 10 pm Saturday night Pittsburgh time. For four nights we'll be staying at a hotel a mile or two to the west of the Imperial Palace. I don't know if there will be much time for sightseeing, but if I see anything interesting I'll let you know. I, too, have a 25th high school reunion and the Oberlin "20th" reunion coming up this summer. If my schedule permits, I'll aim to attend both of them. If there were going to be a 20th reunion of my graduate school class (M.S., Syracuse, 1970), it would be this summer. But the program had only a few dozen students, and we haven't kept in touch. The chairman of the department is still there, and I heard that one of the students worked for several years as a local TV weatherman in Syracuse; but aside from that, I know of the activities of only one other of my classmates. But after Syracuse, apparently at the suggestion of her brother, Edie found herself on the comedy stage. Her voice can approximate that of the Wicked Witch of the West, and she has that Missouri background, so sometime in the late Seventies she ended up in a horrible NBC situation-comedy pilot about a family of moronic hillbillies called The Kallikaks. Fortunately the pilot was never made into a series, so Edie was able to continue her career. She appeared on David Letterman's ill-fated daytime show in 1980, played salesman Herb Tarlek's wife on WKRP in Cincinnati, and now is a regular on The Hogan Family as the oddball neighbor Mrs. Poole. So as far as I know, that's the total impact on national television of the Syracuse University radio-and-TV master's degree graduates, class of 1970. One supporting actress in a sitcom, and one guy who puts the clock on the screen during boxing matches  when he isn't putting extra cigars in actors' mouths. Hardly worth having a reunion of that class, I guess. As you may have noticed, I didn't make it to Oberlin for the class reunion. That weekend, I was working on the telecasts of several stock-car races in Charlotte, North Carolina. If the campus looked better than you remembered it, keep in mind that the college usually schedules cosmetic improvements (such as painting) to be done about the third week in May. The normal, slightly run-down look doesn't return until after the alumni have gone home. And the food service usually doubles its quality for Commencement week  leading to a credibility gap between the seniors, who have been complaining for four years about the dining halls, and their visiting parents, who think that the meals are just fine. I still owe you a report on my trip to Japan in February for the Buster Douglas-Mike Tyson boxing match on HBO. 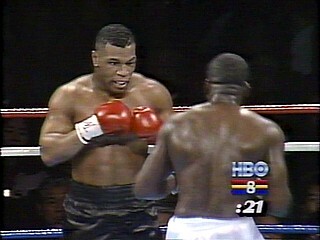 Many, such as Sports Illustrated's Richard Hoffer, called Tyson's loss "probably the biggest upset in boxing history." Riding the bus from Narita airport into the city, we first passed the new Tokyo Disneyland on the bay and then crossed the bridges into what I took to be the financial district. As in Manhattan, tall buildings crowded in on fairly narrow, straight streets. But unlike Manhattan, it wasn't necessary to use those streets to get around; elevated expressways curved among the office buildings thirty feet above the streets, and other expressways curved in other directions thirty feet higher yet. These color pictures are from postcards purchased in Tokyo. It was about 6:00 on a February evening, already dark, but the rush hour still had traffic jammed, even on the expressways. Inside the office towers, all the lights were still on as industrious workers stayed late at their jobs. Some buildings were identified with neon corporate logos, billboard-size, high above us. As our bus crawled along the curving roadway  above the streets, level with the lighted offices, below other roadways and neon signs and the unseen tops of the skyscrapers somewhere in the gloom up above  it was as if the 1920s vision of the future had come to life. I was in a scene from the silent movie Metropolis. 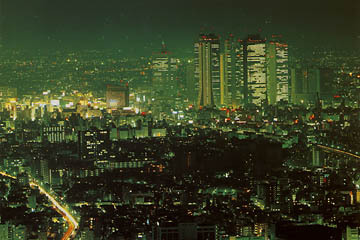 However, our hotel was on the other side of downtown, in a district called Akasaka. We were about half a mile west of the Diet (or parliament), with gardens and parks to the west of us and, next to the hotel, a fragment of the ancient Imperial Palace outer moat (which looked like a small river). Many of the avenues were fairly broad. 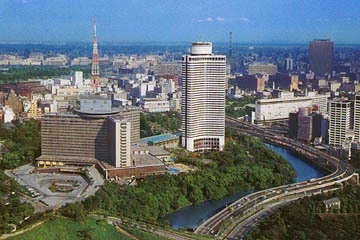 The futuristic New Otani Hotel had appeared (as the villain's headquarters) in a 1967 James Bond movie, You Only Live Twice. So, although Tokyo is a dense city, it didn't seem oppressively crowded. And, compared to some American cities (especially New York), the people in Tokyo are definitely more courteous. I felt more relaxed and at home there than I had in other foreign cities like Seoul and Montreal, where I somehow felt less welcome. Language was not really a problem. The hotel staff was multilingual, and HBO had hired a couple of interpreters to help us work with the staff at the stadium. 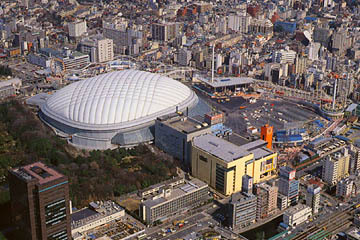 The Tokyo Dome, a baseball stadium with an air-supported roof, was known locally as the "Big Egg." Outside the stadium on Hakusan-dori was an amusement park with movie theaters and, surprisingly, a couple of restaurants specializing in Italian food. 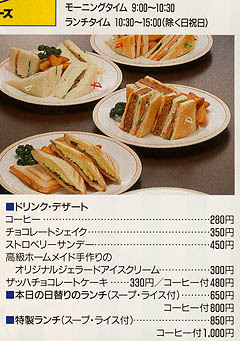 We TV types ate lunch there, ordering spaghetti or iced tea by pointing to color photos in the menu. Arabic numerals being the same the world over, we had no trouble with paying the bill. One evening after my pre-production was over for the day, I was ready to return to the hotel, but others were continuing to work at the stadium. I had to find a taxi. Fortunately, I had been briefed to give the driver my destination as hoteru New Otani. He nodded and took me there. A parliamentary election campaign was going on, and one night in my hotel room I found that the public broadcasting network NHK was televising political speeches. There were rather formalized, the party leader speaking from an otherwise empty stage to a hall full of respectfully intent supporters. The supporters would sometimes applaud, but the politician would not encourage applause nor even wait for it to die out before continuing with the speech. 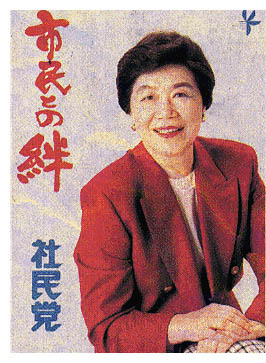 One speech was by a middle-aged woman; from the English-language newspapers I later learned that she was Takako Doi, chairwoman of the Japan Socialist Party. At first I was struck by the remarkable fact that a woman was in such a position of leadership, in a society where a generation ago women were expected to walk behind their husbands on the street. Then I began to appreciate that Doi was a very good speaker, relaxed, expressive, communicating in a straightforward and sincere yet friendly manner. I watched her speech to the end, even though I couldn't understand a word of it. I probably would have voted for her. In response to your last letter: I hope things are better with your depression-prone family. I can remember only one such crying spell when I was growing up, and fortunately it lasted only a day or so. When my mother asked what was wrong, I answered, "The whole world situation." It was the height of the Cold War, and one miscalculation by world leaders could lead to a nuclear exchange that would destroy us all. For me, that reality had just sunk in. My mother counseled me not to worry too much about things over which I had no control, and I soon learned to cope with the threat as we must cope with any unpleasant fact of life  go on living as though the threat isn't really there, as though we and our friends will never have to die. Self-deception often works better than a too-clear view of reality. Highlights of early August 1990 included making a Chyron logo for Johnny Tyous at syndication company Raycom. They were preparing to televise the Cowboys-Oilers preseason football game, sponsored by First City Texas as the "Governor's Cup." On August 10th, I traveled to Lake Tahoe, Nevada, for an HBO boxing tripleheader at Caesars Tahoe. We stayed across the road at the High Sierra Hotel. The California state line was only a couple of blocks away, so on the morning of the 11th I walked to California for breakfast. (How many Pennsylvanians can say that?) Then on the 12th, driving back to the Reno airport, I visited the fabled mining town of Virginia City. Another HBO telecast took place in Reno two months later. While there, I wrote a note to future operators about an improvement I had made in the numbers (such as Round 10) that opened each round of boxing. Calling one of the autodisplays from 1 through 12, say autodisplay 3, will erase both channels and wait for a keystroke. While waiting, the counter will display "3333" (for example) to confirm that you've called up the correct round. Upon the first keystroke, the blind-reveal animation of the round number happens. Next the autodisplay invisibly calls up 70, the trunk colors, below the chevrons on channel two. (In order for this to work, I modified the red and blue subpalettes on 70.) Then the autodisplay waits for a second keystroke. When the director loses the round number, give this second keystroke. The CCM is cleared, the chevrons on channel two are deleted to reveal 70, and channel one is erased. Now you can immediately call up 72 or 71 as desired on channel one, and/or XFER to the trunk colors. All this is to get you from the round number to 72 / 71 / 70 as quickly and easily as possible. Having already invented a compact symbol to depict "runners on base" for a baseball scoreboard, in the spring of 1991 I tried to condense the way we indicated "0 OUTS" or "1 OUT" or "2 OUTS." Would the viewers grasp the meaning of tiny symbols like this? But I never actually tried this "traffic light" idea on the air. In the 90 seconds before an Eat 'N Park commercial, we generally seem to get set up with half a minute to spare. But in the zero seconds after the commercial, it's usually a difficult scramble to get back into game coverage smoothly. We have panic fades to black and immediately back up. Might it work better if the commercial were the third spot in the break instead of the fourth? I finally found out that yes, I will be working for the Pirates Television Network again in 1991. KDKA-TV has been going through cost-cutting and layoffs, so I wasn't sure that they would hire me again this year, but now I have the schedule for 50 baseball games. Unfortunately, the first of those games (a spring-training telecast from Florida) conflicts with an NBA game that I had scheduled with TNT: Cleveland at Boston on March 29. Could I ask you to assign another font operator to go to Boston? Since KDKA gives me five times as much work as TNT, I feel that I owe them first priority, especially for their first telecast of the season. Looking ahead to the possibilities for the playoffs, it looks like I'll have baseball every Tuesday, but maybe we'll be able to work something out on other days. I spent three days at West Virginia University in April 1991 "to provide training for the operation of Radio & TV's Chyron 4100 television graphics system." Becky West, now Becky Hardwick, was one of my students. The next month, I spent an entire week in Charlotte, North Carolina, helping to televise Pole Day and a Grand National race and the big Coca-Cola 600. I too have several Canadian Brass albums. I've always liked the sound of that sort of ensemble, ever since I was walking through Tappan Square one early Sunday evening and heard a group of students playing in the bell tower of Finney Chapel. I especially enjoy baroque music as played by the Canadian Brass. In particular, many of Bach's key board works gain more life when they're performed on something other than the organs or harpsichords for which he wrote them. Synthesizers and brass ensembles can separate the counterpoint more clearly; symphony orchestras can express emotions. For example, when I play or listen to the F-major Toccata and Fugue, I hear the notes  organ pipes sounding or not sounding, on or off without expression. But I imagine much more that should be there: trumpets, tympani, cymbals, strong emphatic accents. One Two! Three! One Two! Three! One Two! Three! One!! The music is somehow greater than the instrument. This spring, my reading has been mostly history, including the Personal Memoirs of U.S. Grant. These volumes cover the successful part of Grant's career (through the end of the Civil War) and don't touch on his Presidency (which did not go so well, although he remained personally very popular). Buried among a lot of numbing detail about military campaigns, I found some nuggets of interest. Grant says flatly that American Southerners settled in the part of Mexico called Texas as "a conspiracy to acquire territory out of which slave states might be formed for the American Union." If that's true, it's certainly downplayed in modern-day histories of Texas. In describing a bullfight in Mexico, he explains the seating arrangement in detail. "The audience occupies seats around the ring in which the exhibition is given, each seat but the foremost rising higher than the one in front, so that every one can get a full view of the sport." Apparently stadiums were unknown in the United States of his day. But that's to be expected, since the only spectator sports were horse racing and baseball. He also describes how the early San Francisco expanded, which had puzzled me when I visited that city. "There had been but one wharf in front of the city in 1852  Long Wharf. In 1853 the town had grown out into the bay beyond what was the end of this wharf when I first saw it. Streets and houses had been built out on piles where the year before the largest vessels visiting the port lay at anchor." I'm not particularly aggressive in pursuing my career; I prefer to do a good job and take advantage of opportunities as they arise, rather than continually seeking them out and trying to make things happen. So I was glad to read the sentence with which Grant opens his book: "There are but few important events in the affairs of men brought about by their own choice." And later: "This incident gave me even a more favorable opinion of Meade than did his great victory at Gettysburg the July before. It is men who wait to be selected, and not those who seek, from whom we may always expect the most efficient service." 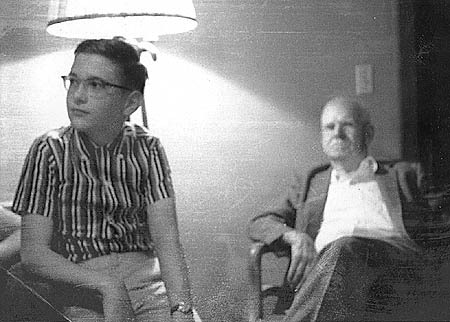 And speaking of careers, while my father and I have each stayed in the same general line of work all our lives, his father did not. H.F. Thomas tried farming for a while, owned a café, did odd jobs, ran a gas station, owned a laundry, and tried several other ways of making a living. I once lacked some respect for him because of this shifting around. But now I read that U.S. Grant  growing up in the same part of the country a couple of generations before my grandfather, telling some of the same stories of his boyhood that my father tells  also had no profession in the period between the Mexican and Civil Wars. He tried farming in 1854, then went into real estate in 1858, failed to get appointed County Engineer, and finally went to work as a clerk in his father's store in 1860. Nine years later he was President. Another book I've been reading is Nat Brandt's The Town That Started the Civil War. The town in question is Oberlin, Ohio, and the incident was the Wellington Rescue. On September 13, 1858, Oberlin abolitionists were aroused by the sudden kidnapping of a runaway slave, who had escaped from Kentucky two years before. A large number of students, professors, and townspeople rushed south to Wellington, where the slave-catchers (claiming the authority of the federal Fugitive Slave Act) were holding their captive while awaiting the evening train for Cincinnati. The throng surrounded the hotel in a scene of confusion comparable to the surrounding of a military recruiter's car over a century later. Oberlin people, acting on high moral principle, were opposing representatives of the federal government. Finally, after much negotiation, the slave was freed and hustled off to Canada. Some of the abolitionists who freed him were later jailed in Cleveland. The publicity surrounding their trial helped set the stage for the Civil War. A writer claimed that "Oberlin commenst this war. Oberlin wuz the prime cause uv all the trubble." Besides the parallels with the Vietnam era, other details in this book interested me. For one example, did you know that at the time of its completion in 1845, First Church was the largest building west of the Allegheny Mountains? And that the size of Charles Finney's congregation there was second only to that of Henry Ward Beecher's in Brooklyn? Ah, but enough of this history. Back to current events. I'm off to California next week for the first West Coast trip of the season for the Pittsburgh Pirates. New and revised team logos are as follows on your KBL system disk. Pp (font id's 10 and 20): to correspond to the current artwork, I brought the top of the triangle down 14 lines and the right side in 50 pixels, fixed the penguin's beak, and gave him white gloves (instead of gold) and solid black tape on his stick. Ss and Nn (font id 10 only): both the Sharks and the [North] Stars use subpalette 700 502 000 063 705 003 777. On "MGM 1991" are two graphics and an animation. WPXI91G is for the parade, except that color 4 should be 004 (a darker green). WPXI91W is for the carol sing. WPXI91PA animates the parade graphic by making the star slowly brighten and dim. On "WPXI 1991 HBC System" are Helvetica Bold Condensed fonts. Autoload 0 is 05/25/00/30/--/10. The following item was in the newspapers last July. She lay trapped inside a dark and dusty chimney with her 6-year-old friend for nearly an hour. Firefighters found the only way to free them was to demolish the chimney. But when all was said and done, 10-year-old Bonnie Earle had one question: If two little girls couldn't make it from the top of the chimney to the living room fireplace, how could Santa Claus? Firefighters and family members said it was that kind of reasoning that led Bonnie and Nicole Jones to try to get in through the chimney Tuesday afternoon after Bonnie lost the keys to her grandparents' San Mateo home. Yes, Bonnie and Nicole, the elfin Santa can make it down the chimney, for he is nothing like the big old scary men who pretend to be Santa in the shopping malls. He's not the boss of the elves at the North Pole; he's the chief elf! This truth is read to us every year, yet we hear it not. On other matters, I was one of the recipients of a mass mailing from harpist Georganne Cassat, who was a Conservatory freshman at Oberlin the year that we were seniors. It seems that she's made a recording (of Marcel Tournier's "Images"), and now she's trying to sell it. So she made up a mailing list. She didn't buy the list from the college. Rather, she used what the college's fund-raisers had sent her as an alumna: a list of donors. She reasoned that these donors (1) are inclined to do favors for Oberlin people and (2) have a little extra money lying around, so she looked up their addresses in a college directory. I'm probably going to order one of her CD's. Even if I don't find Tournier interesting, I can always use it as background harp music. I'm generally impressed when people are able to combine lists in order to zero in on a few prospects with a particular combination of interests. A few years ago, I received a mailing because I was both an Oberlin alumnus and a person who had ordered a book on architecture. 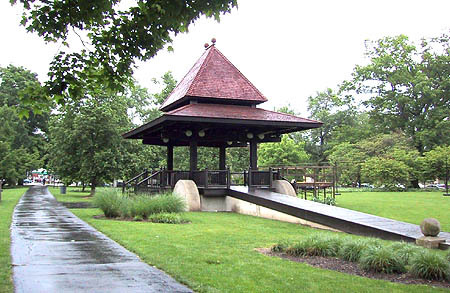 This mailing offered The Oberlin Book of Bandstands, detailing various entries in a 1985 competition to design a bandstand for Tappan Square. The winning designer turned out to be Julian Smith '69, and his Asian "festival cart" design now stands on the northeast quadrant of the square. I said yes to that mailing, too. Well, enough for this mailing. It's almost time for Christmas. I'm having mine a week early this year; because of my schedule, which includes hockey telecasts in Pittsburgh on the 21st and the 26th, I've scheduled my trip to Ohio to visit my father for this week, so our Christmas will be on December 18. There are two message disks, one to be copied into Drive A and the other into Drive B. The basic concept: Most information on individual players is recorded in the form of "files" on Drive B. Everything else is on Drive A. Obviously, we don't air a file the same way that it's recorded. 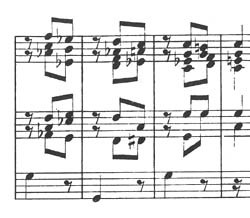 Rows 2 and 3, called "note x," are the most-likely-to-be-used note. 1. The opponents get "1" followed by their uniform number, that is, 100 to 199. 2. Most Steelers get "0" followed by their uniform number, that is, 010 to 099. 3. But Steelers with single-digit uniforms get 200 to 209. 4. If two players have identical uniforms, assign one of them an unused player number, or a number between 210 and 248. Do the same for the head coaches. So Bubby Brister, uniform number 6, has player number 206, and his file is at address 2060 on Drive B. The only other messages recorded on Drive B are a set of autodisplays from 0 to 39, which are similar to the autodisplays at the same addresses on Drive A. Here are the details. DOWN AND YARDS: 1 clears the screen to "1st and 10." 2, 3, and 4 require you to type in the yards to go. Then you can use 0, 5, or 6 to add the yard line if desired. On a goal-to-go situation, use 31 through 34 instead. REDUCE AND EXPAND: If a file is on the screen, 7 will push it down to a lower third consisting of the name and note x, and will select Drive A. If a lower third is on the screen, 35 will pull it back up to the file configuration and will select Drive B.
PLAYER-NUMBER AUTODISPLAYS. Autodisplays 8 through 29 will do the following: erase the screen, access Drive B, invite you (by showing ?? ?0) to enter the player number on the address keypad, add the final 0, and read that address. In most cases, they then will manipulate the file in some way. For example, autodisplay 9 is called "Get note x." To use it, press [Aux 9], [READ], [Aux 2-0-6]. In a second or so, you'll see Brister's stats as a lower third, and you'll be back in Drive A where you belong. The cursor is on row 2. If what you really want is note y, press [DELET ROW] three times. For note z, press [DELET ROW] an additional three times. Autodisplays 21 through 29 create shells in the note-x position. For example, suppose Louis Lipps makes a 19-yard catch and you want to enter his receiving stats for this game. Press [Aux 2-3], [READ], [Aux 0-8-3]. His file is on the screen, and you're in Drive B with the address counter still reading 0830; but rows 2 and 3 of the file have been replaced by a shell for pass-catching stats. Type "1" and "19." Then press [HOME], [RECORD], and the revised file is recorded at address 0830. Finally, if you want to use these stats immediately, press [Aux 7], [READ] to reduce them to a lower third. The disk package includes two orange system disks, two "A" message disks (green and brown), and two "B" message disks (green and brown). I have one of each of these three kinds of disk myself. If you get time at Morgantown, you can load rosters and some hero notes onto one of the "B" floppies (let's say the green one). Then at Pittsburgh on August 8, copy to green "A" to hard drive A and the green "B" to hard drive B. After the game, there should be enough time for you to make four disk copies. Copy hard drive A to both "A" floppies, and hard drive B to both "B" floppies. Keep one set (let's say the green "A" and "B") for yourself, along with one of the system disks. If you have time in the next three weeks, you can replace the Eagles with the Giants on the green floppies. Give the other system disk and the two brown message disks to your font coordinator, Ted Beam. He will give them to me in New Orleans on August 17. After that game, I'll copy my hard drives back to the brown floppies and give the disks back to Ted, so that you will have them on August 29. Why would you need the browns on August 29? We might have created some new promos in New Orleans or made other revisions. But you will not want to use one of our revisions: according to current plans, for August 17 only we will replace the Steelers 92 logo on the lower third scoreboard with the NFL logo, because our feed will be going not only to Steelers stations but also to Saints stations. On site, the usual procedure is that Ted Beam will go over the flip chart with you, entering officials and starting lineups (always subject to 11th-hour changes). I like to confirm with the flip chart every player on the roster, including height and weight and such. The "Xth year" stat usually gives us problems. The theory is that a player who in college terms would be entering his junior year is entering his "3rd year" for our purposes, but sometimes on the charts he's listed as having "2 years NFL experience." The problem arises when they merely give you a number "2" or "3" and you have to figure out which way they mean it. One final item: if the autodisplays relating to files (7-30) don't work well for you, you've got plenty of space on drive A (700-2090) to build individual heroes and stats as lower thirds.